Winter is the height of cold and flu season, but with the right combination of healthy habits and smart strategies, you can strengthen your immune system and keep thriving all winter long. The 6 tips below will help you head into winter prepared to defend against illness and feel your best. 1. Dial down inflammation: It’s critical to reduce inflammation in your body to prevent illness. Fighting chronic inflammation suppresses your immune system, making it tough to defend against germs. The main offenders behind inflammation are a high-sugar impact diet and the foods most likely to cause food intolerance like gluten, soy, and dairy. Be mindful of your sugar impact and include plenty of immune-boosters in your diet, including anti-inflammatory omega-3 fats, coconut oil, and nutrient-packed superfoods. 2. Take care of your gut: Your gut is home to 70% of your immune system and holds a community of trillions of microbes that play a key role in your immune function. That’s why it’s critical to keep your gut healthy, so you have more good flora to fight off viruses and bacteria that can make you sick. Including foods with probiotics and prebiotics in your diet is a great way to build up the good guys in your gut microbiome-think full-fat, unsweetened coconut or Greek yogurt and fermented foods like kimchi and sauerkraut. 3. Optimize your Vitamin D: It’s well known that vitamin D helps keep your bones strong, but vitamin D also plays an essential role in your immune system. Research proves that not only can vitamin D help ward off illness, but it can also reduce the duration of an infection. That makes vitamin D vital to staying healthy. Spending time outside in the sunshine is the best way to get vitamin D -15 to 20 minutes of direct sun exposure is all it takes for your body to produce this potent hormone. (It’s not just a coincidence that more people get sick in the winter when sunlight is scarce!) If you’re struggling to get the sun exposure you need on gray winter days, then schedule an appointment to get tested for a high-quality vitamin D supplement. 4. Get high-quality sleep: Studies show you need 7 to 8 hours of uninterrupted sleep to trigger the production of immune cells that attack foreign invaders. As a matter of fact, subjects in one study who slept fewer than 6 hours a night the week before were 4 times more likely to come down with a cold than those who got more sleep. Developing a healthy nighttime routine can go a long way toward helping you get consistent sleep. 5. Get more antioxidants: If your gut instinct is to reach for vitamin C when you have a cold, it turns out there’s good reason! Antioxidants like vitamin C lower your risk of infection and protect your immune cells. Be sure to incorporate a variety of antioxidant-rich foods in your diet to stop a winter cold in its tracks. That includes yummy choices like almonds and berries. 6. Get moving: Regular exercise triggers the production of immune cells that fight off cold and flu germs. 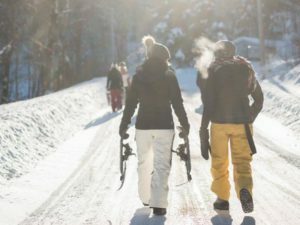 Take part in winter activities such as skiing, ice skating, and sledding regularly, or take a trip to the gym if you don’t like the cold. Here’s to a winter full of love, laughter, and optimal health! Article adapted from Rodale Wellness.